Photinia ‘Red Robin’ is a popular garden shrub or small tree with shiny, evergreen leaves. Provided it is not pruned the previous autumn, it will produce masses of flattened heads of small, white flowers from April to June. Some people dislike the fragrance, which is often compared to hawthorn. However, the plant’s main value lies not in the blossom, but in the bright red colour of the new leaves and shoots. The foliage gradually turns glossy green as it matures. Photinia is a genus of approximately 50 species of shrubs and small trees. The name derives from the Greek word ‘photeinos’, or shiny, referring to the glossy young foliage. ‘Red Robin’ is a variety of Photinia x fraseri, a hybrid named after the Fraser Plant Nurseries in Alabama in the United States, where it was first discovered as a seedling in 1943. The ‘Red Robin’ variety was subsequently developed in New Zealand, and with its highly coloured new growth it has become by far the most popular of all garden Photinias. Photinia ‘Red Robin’ is available as a container-grown shrub or as a three-quarter standard, pleached or full standard tree. With its colourful foliage, fast growth rate and evergreen character, it is a good hedging choice. As it is easy to shape, Photinia also makes an excellent topiary shrub. This article looks at this popular shrub and gives tips for getting the most out of it in the garden. A number of Photinia species are used as garden shrubs or trees, including P. davidiana, P. serratifolia, P. glabra and P. villosa. There are also a number of well-established and popular hybrids, such as Photinia ‘Redstart’ (Stranvaesia davidiana × P. × fraseri), and this article focuses on Photinia × fraseri, which is the hybrid between P. glabra and P. serratifolia. This variety is the best known and most easily sourced Photinia. It can be used as a specimen shrub or small tree, or planted as a hedge. ‘Red Robin’ grows to 5m tall and has the RHS Award of Garden Merit. This more recently introduced cultivar is similar in colour and general appearance to the popular ‘Red Robin’ but is a dwarf variety that grows to a height and spread of no more than a metre. This is a recently developed variety with bright scarlet flushed young growth and a free branching habit. With an ultimate height of just 2m, ‘Cracklin’ Red’ is suitable for containers, smaller gardens and for lower hedges. ‘Camilvy’ is similar to ‘Red Robin’, with slightly deeper, more coppery-red new growth. It reaches about 3m tall and is slightly more tolerant of light shade. It has the RHS Award of Garden Merit. ‘Curly Fantasy’ has wavy-edged, curled and toothed dark green leaves that are characteristically red when young. It grows up to 3m tall. Also known as ‘Cassini’, this cultivar has rose-pink tinted new growth and marbled, creamy-white leaf variegation. It has a denser growth form than Red Robin and is particularly suitable for hedging. The young leaves emerge in vivid reds and pinks, and the variegation develops through the spring and early summer, though the leaves retain a slight pinkish tinge until autumn when they develop a deeper burgundy or bronze colour. It will grow to 4m but colours better when regularly trimmed as a hedge or trained shrub. This is another eye-catching variegated variety with foliage in various shades of green, cream and pink, giving the shrub or hedge a colourful and decorative appearance in a sunny spot throughout the year. The young foliage is a warm pink, and it develops into the typical glossy green with cream and dark pink patterning during the summer. It will grow up to 3m tall, but it can be pruned to fit a large patio container. Photinia ‘Red Robin’ grows best in full sun in a sheltered position, though it will tolerate a little light shade. Young shoots can be damaged by cold, drying winds and frosts if planted in an exposed part of the garden. It needs good air circulation to avoid disease, so while it will grow well near a wall or fence, it should not be planted tightly in a corner formed by two solid walls or fences. Ideally, the soil should be free draining but moisture retentive. Plenty of garden compost or well-rotted manure can be dug into a slightly heavier soil to ameliorate it sufficiently to allow a Photinia to grow. The shrub will not, however, do well in a very heavy clay soil or waterlogged conditions. The best times to plant Photinia ‘Red Robin’ are spring and autumn, though container grown plants can be planted at any time of the year long so long as the soil is not frozen. Summer plantings will require a lot of watering over the first few months. To plant a container-grown Photinia, dig a hole double the width of the container to the depth that allows the top surface of the compost to be level with the surrounding soil. Work a handful of blood, fish and bone into the base of the hole, loosening the soil at the same time. Place the plant into the centre of the hole and back-fill around the plant. Firm the plant in gently but firmly to eliminate any air pockets without damaging the roots. Water well to settle the plant and the surrounding ground. For a Photinia hedge, individual plants are generally planted at 75cm centres. New shrubs should be watered whenever there are dry weather conditions during the first two growing seasons. A spring and autumn feed with blood, fish and bone over the same period will help produce a good root system, and keeping the area around the plant weed-free by mulching will also help with establishment. After two years they will rarely require much further attention other than normal pruning or cutting to maintain the desired stature and shape. Specimens grown in containers will require regular watering and feeding. Photinia ‘Red Robin’ prefers a position in full sunlight but it will also grow quite successfully where there is light shade for part of the day. Once established, the plant is fairly drought tolerant, but newly planted specimens and hedges will require regular watering over the first two years while they develop a healthy and extensive root system. Photinia ‘Red Robin’ grows well in most garden soil types so long as they are well drained. Some moisture retention is needed, and a deep loam is ideal. They are unlikely to survive in waterlogged or very heavy clay soil. 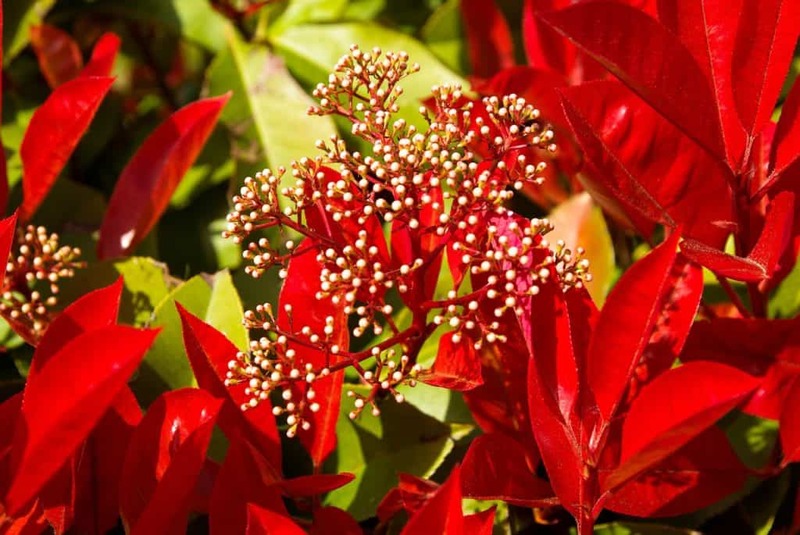 While some species of Photinia respond badly to a chalky soil, Photinia ‘Red Robin’ will tolerate any normal acid, neutral or alkaline conditions. Established shrubs will not normally require feeding, but if they suffer from excessive and sudden leaf drop or are clearly not doing well, then a top dressing with blood, fish and bone may provide a boost. After six to eight weeks in new compost, pot-grown Photinia ‘Red Robin’ will need feeding monthly from March to August with a balanced, slow release fertiliser with trace elements: specific formulations are now available from garden centres for shrubs, and these are ideal. Photinia do well in containers, with some of the dwarf or smaller varieties such as ‘Little Red Robin’ being ideal. A single ‘Red Robin’ will grow quite happily in a container with a diameter of 50cm or more, though care must be taken to use a pot of suitable size, shape and weight to avoid a top-heavy shrub blowing over in the wind. Standard multi-purpose compost or a John Innes No 3 can be used. They must be well watered in, and then watered each time the top couple of centimetres of compost feels dry to the touch. Photinias do not compete well with more vigorous shrubs and trees for water and nutrients, so if grown as specimens or hedges in or alongside shrub borders, careful choices of neighbours need to be made. Smaller, slow-growing shrubs are preferable. Evergreen, variegated varieties will provide relief during the summer when the Photinia ‘Red Robin’ is green and a startling contrast in the spring and autumn when the colours of the Photinia come into their own. Variegated Euonymus cultivars such as ‘Harlequin’, ‘Emerald ‘n Gold’ and Emerald Gaiety are suitable, or for a taller alternative, ‘Silver Queen’. The red and cream variegation of Hebe ‘Rhubarb and Custard’ picks up the red foliage colour of ‘Red Robin’ well. Other shrubs that make good companions to ‘Red Robin’ on more acidic soils include Pieris japonica ‘Little Heath’ and Pieris ‘Flaming Silver’. The variegated Japanese spurge, Pachysandra terminalis ‘Variegata’ can be planted around Photinia ‘Red Robin’ to create a complementary, 20cm tall mat of evergreen leaves with cream margins. The form and colour of Photinia ‘Red Robin’ also provides an excellent backdrop for a herbaceous border with plants such as lupin, phlox, delphinium, hardy geranium and Rudbeckia, or to ornamental grasses such as Miscanthus sinensis, Stipa gigantea and Molinia caerulea. Photinia ‘Red Robin’ can grow up to 30cm in a year and it will achieve a height and spread of some 5m if left unchecked, so it will need pruning quite frequently to keep it in shape. Plants should not be pruned in their first three years. Pruning also encourage new foliage growth with the bright red colour, though this will be at the expense of flowers unless the pruning is carried out no later than mid-June when the flowers are dying back. Pruning later than this means that the wood on which next year’s flowers will form is removed. 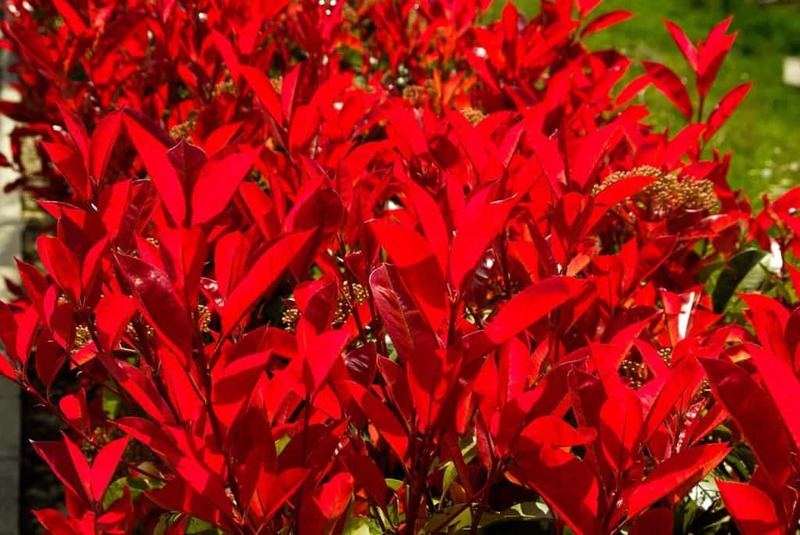 Fresh red foliage can be produced by pruning at any time from spring through to autumn, so a decision can be made as to whether the red foliage or flowers are the more desirable feature. A further consideration is that pruning from August into the autumn will produce new growth that may be susceptible to damage by early frosts. Regular maintenance pruning involves cutting stems back to just above a leaf or outward facing bud. Removing 15cm to 20cm of growth should be sufficient to keep the shrub at its existing size, and it will respond well to this sort of maintenance as long as it has reached around 1.5m high as a minimum. The best of the cut stems can be used in vases and flower arrangements. Photinia ‘Red Robin’ hedges can be trimmed with shears or hedge clippers without worrying too much about the position of buds or leaves, as the fresh new growth will soon disguise any blemishes or stubby twigs. A shrub that has got out of control can be given a drastic renovation pruning. In May, cut all of the stems down to 60cm above the ground and thin what is left by removing some stems to ground level to give an open centre to the plant. As new growth forms, retain the best stems and remove any others. The best method for propagating Photinia ‘Red Robin’ and other P. × fraseri cultivars is by softwood cuttings taken in early summer, or by semi-ripe cuttings taken in summer or autumn. Both types take well with a high rate of success. The cuttings should be approximately 10cm long, taken from a stem that is approximately 1cm in diameter. Cut just below a leaf node and remove the lower leaves from the cutting. Place them immediately into a plastic bag to avoid them losing water until they are ready for planting. They should be planted around the side of a 12cm pot as soon as possible after cutting, using an equal mix of general purpose compost and horticultural grit. Insert them some 4cm into the compost and gently firm to ensure good contact between the stem and compost. Place the pot in a shallow tray of water for thirty minutes to ensure that the compost is wetted without waterlogging the surface. Cover the pot with cling film or a plastic bag supported on sticks or wire frame to avoid the plastic touching the leaves. Place the pot in a cool, bright position, out of direct sunlight. The cuttings should show signs of root growth within three weeks, at which point the plastic bag should be removed. They can be kept over winter in a cold frame or unheated greenhouse, watering sparingly when the compost is dry, before planting out the following spring when any danger of frost has passed. Photinia ‘Red Robin’ is generally a healthy plant and it is rarely seriously damaged by pests or diseases. The one exception is its vulnerability to leaf spot fungus. Some moth caterpillars will eat the leaves of Photinia, but damage is seldom serious or long lasting. Container-grown plants from garden centres and supermarkets should be checked for signs of vine weevil damage by carefully knocking the plant out of its pot and inspecting for tell-tale damage to the roots. Adult vine weevils are generally only active at night so are seldom seen, so it may be the cause of otherwise inexplicable damage to leaves. At that stage it is likely that the larvae have already damaged the roots and caused more serious damage. Badly affected plants may need to be destroyed and replaced. With the exception of leaf spot, Photinia ‘Red Robin’ generally has good disease resistance. The symptoms of leaf spot are round, dark red or black blotches on the leaves, sometimes more noticeably on parts of the plant that are less exposed to full sun. The affected leaves eventually fall off and in extreme cases the plant can be defoliated. If caught early, individual diseased leaves can be removed. With more extensive damage, the whole plant can be pruned hard back in May and all of the cut material burned or disposed of. The plant should come back well with fresh growth. If the problem repeats, it may be better to destroy the plant and provide a replacement elsewhere in the garden. Leaf spot is not the only possible cause of blotchy leaves and leaf drop, so careful diagnosis is necessary. In many cases, defoliation can be caused by environmental conditions such as prolonged humidity or exposure to cold, drying winds. Photinias are also quite prone to honey fungus. This spreads just under the surface of the soil from shrub to shrub and attacks the plants’ root systems, restricting their ability to absorb water and nutrients. Affected plants look generally unhealthy with wilting and loss of foliage colour, and the white fungal mycelium may become apparent around the base of the stems. A whole area of shrubs and trees can be affected, though some species are relatively less susceptible than Photinias. Often the only successful course of action is to destroy affected plants and to replant with species that are resistant. Q I need a hedge to protect my garden from a neighbouring footpath but also want it to look good and grow quickly. Is Photinia ‘Red Robin’ a good choice? While Photinia ‘Red Robin’ is a very versatile shrub that makes a decent hedge, it may not be the most suitable for the situation you describe. It will certainly grow quickly and look very attractive, but it will not form the most secure barrier because it has no thorns and it is easy to part and push through. In addition, it can quite often lose a lot of lower leaves at one time and can therefore be intermittently poor as a visual screen at the lower levels.